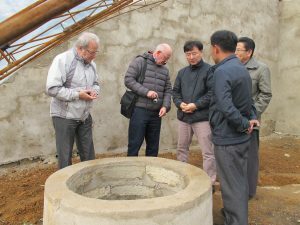 In early November 2016 we visited Sariwon, the site of our greenhouse project, the construction for which had begun in Spring. Faced by a flood in the Summer, we had faced unforeseen complications and delays; but it is progressing as well as it is taking to complete the building. Walls upon what was once barren, unused land soon became rooms with metal bars sketching completion, and witnessing the vinyl roof being put atop the ceiling brought us such joy! The greenhouse – with its much scrutinised-over details in effort to utilise every inch of the land, innumerable blueprints and call for precise construction – is evidence of all the blood, sweat and tears given to the project from every individual who has made it a success. To all these individuals, we would like to say: ‘Well done – and thank you’. 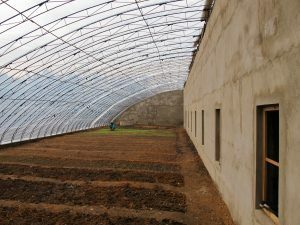 We look forward to seeing how this project and its produce will help and bring happiness to many people in Sariwon through the changing seasons and under all weathers.